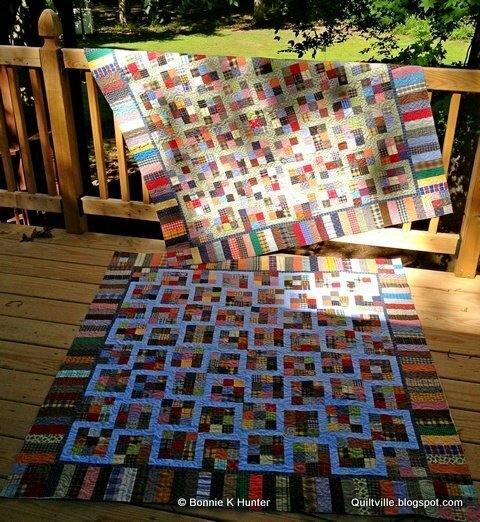 "These 9 patches were made with 2” squares cut from recycled plaids, stripes and prints and sewn together with no attention paid to what was light or dark, just sewn randomly in between the lines of working on other projects. I pinned them into groups of 10 so I could keep track of how many I needed. 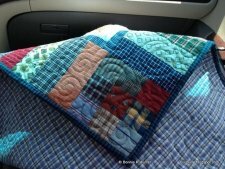 "When I needed two baby quilts to be done AT THE SAME TIME, it was these 9 patches just waiting for a project to give them life that called to me. 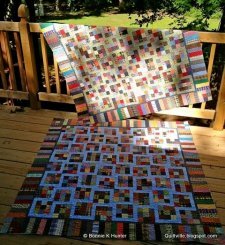 "And those of you who have followed along will remember that it was a kismet moment – these 9 patches include fabrics from my grandfather’s shirts. The baby quilts are for his great-grandsons. It’s a heart swelling realization of how families continue to grow. We are connected! So let’s start!"